Intermediate/Advanced. 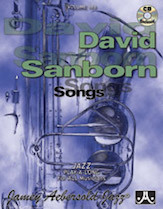 A smooth blend of the songs written and recorded by the great alto innovator David Sanborn and his side-man Marcus Miller. State-of-the-art studio production techniques and authentic arrangements by keyboardist Georgy Whitte make this Play-A-Long a sweet change of pace.